Exquisite dream home situated on desirable cul de sac in La Costa Greens! One of the largest lots in Viridian, on approx. 1/4 acre lot! This luxurious home has upgraded custom features designed to perfection! Front courtyard entry w/ patio, firefall, & a casita is perfect for an office or guests! Chef's kitchen, SS appliances, large center Island. Solar electric saves you $! Entertainer's backyard w/ beautiful saltwater pool & spa, fire pit, b/i BBQ, & turf grass. 4 car garage w/ epoxy flooring. 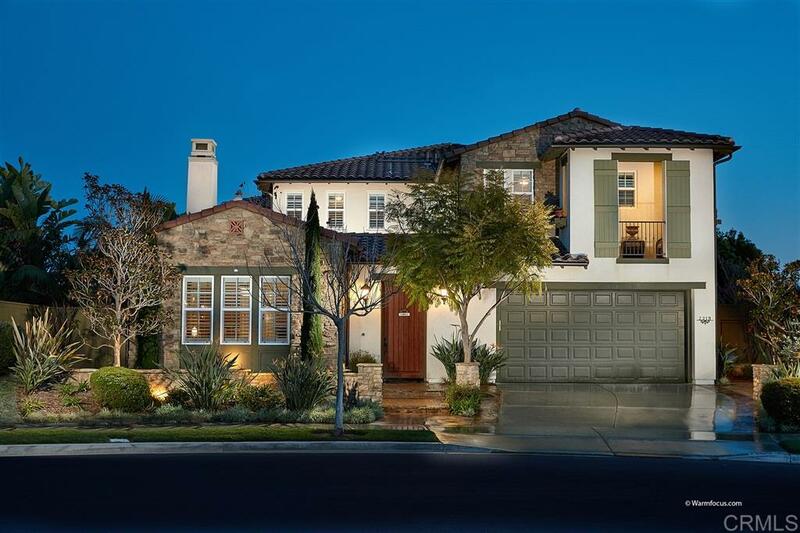 See supp., Welcome to 2319 Kyanite Pl, located in desirable La Costa Greens! Step inside to an expansive courtyard entry way, with casita, patio & relaxing fire fall! Beautiful salt water pool & spa, Built in BBQ, fire pit, and low maintenance turf grass! Gourmet chef's kitchen features large island w/ granite, stainless steel appliances, custom lighting, built in desk area, and wine fridge area with custom tile work & shelving! Other upgrades include travertine flooring, crown molding & casings, custom wallpaper & built in cabinets. Additional room/office downstairs with full bath! 4 bedrooms upstairs, plus a bonus room currently used as a movie theatre room for the whole family to enjoy! Solar system on the house & pool offers hundreds of savings $$! EV hook up in the 4 car garage with epoxy flooring & built-in cabinets. Soft water system, newer hot water tank (2018), custom outdoor lighting, upgraded security system, new thermostats. Residents of La Costa Greens have the exclusive use of "The Presidio" and its Resort-like amenities, including a community pool, tennis courts, workout & recreation room. Convenient to Legoland, shopping, entertainment, and easy drive to North County's best beaches! CARLSBAD SCHOOL DISTRICT! LIVE THE RESORT LIKE LIFESTYLE OF LA COSTA GREENS!